Whose Tweet Is it, Anyway? Following the Royal's extra innings win over the A's last night, Toronto Sun columnist Steve Simmons tweeted at Blue Jays all-star Jose Bautista. Usually, such rhetorical tweets don't get a reply from the athlete mentioned. 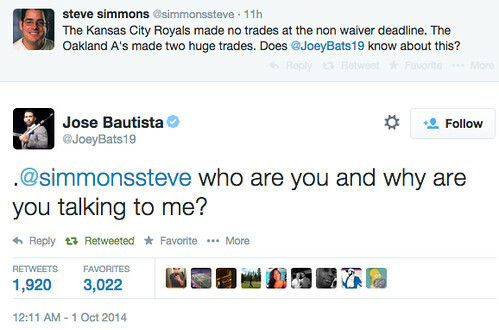 This time, Joey Bats responded. Good for Bautista, right? I was one of over 1900 people to retweet his response because it was so out of the ordinary. But what if Jose Bautista didn't write and send that tweet? 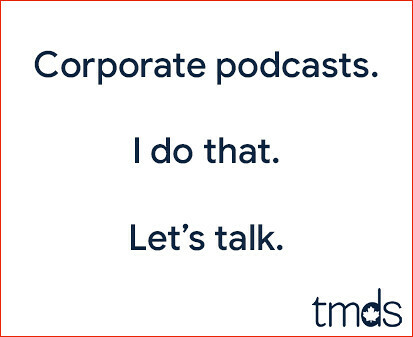 What if a PR firm managed his Twitter feed? It looks like that tweet was actually sent by someone at the PR firm responsible for Bautista's Twitter feed. Personally, I avoid following all verified Twitter accounts when the owner of the account doesn't do their own tweeting. I have no interest in hearing from a hired PR firm. I'd like a list of celebrities who manage their own Twitter account. Someone should create a definitive list. Unfortunately, it doesn't look like Joey Bats would make that list. For clarification, which is next to impossible in this venue, Jose Bautista doesn't tweet. A marketing firm takes care of his account. Things move quickly on Twitter! So it does seem Jose Bautista tweets himself, which pleases me. Steve Simmons looks like even more clueless than usual for tweeting that Bautista's PR firm was tweeting from his account. I think that both could be true (both Bautista and his PR could tweet from the same account) and I do agree that Simmons shouldn't have taken the bait with the second comment. He should have known better. As far as I'm concerned the first comment was fine, 8 times out of 10 the athlete doesn't respond to something like that, the fact that he did, Simmons should have just left it alone knowing full well that no one wins a twitter battle...except...maybe...the one with the most followers. Bahahaha, this is almost as good as when Simmons got lambasted and embarrassed press conferences by Dana White and Brian Burke. Jose does do his own tweeting. He's a good guy. He is very much legitimate. Looks good on the SUN! How is Simmons still employed? ?